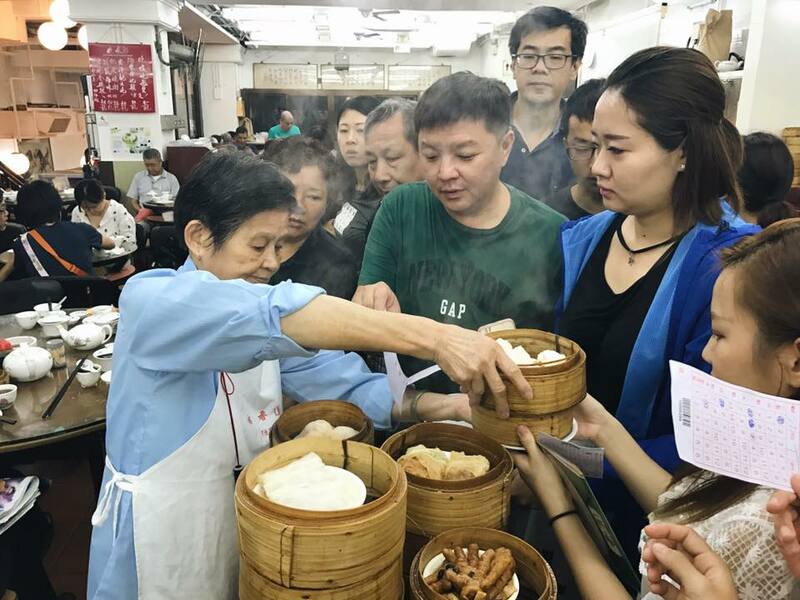 At this insanely popular dim sum restaurant, customers would follow the dim sum granny and her cart like bees swarming over their hives. But we know much better than to follow the crowd like that! Here's another tip: If you're at a dim sum restaurant with dim sum trolleys, never, ever try to take a dish by yourself when you're in front of the dim sum cart. It's a huge no-no to the dim sum grannies. Just tell her firmly and politely which dishes you'd like and hopefully she'll give them to you before they run out. And don't forget to bring your dim sum card with you when you're on your hunt. Looking for the best dim sum restaurants in Hong Kong? Our guide is here to help. This small and crowded dim sum restaurant is located in Prince Edward in Kowloon and it's also a 1 Michelin Star recipient! There's always a queue lining up outside and it takes around 20 minutes to get seated depending how packed the restaurant is. They serve all the traditional dim sum fares at very affordable prices! Who says dining at Michelin-star restaurants have to be an expensive, fancy thing? You can check out the menu (available in English and Chinese + a bunch of other languages) while you wait in the line. Check off the boxes of items you want to order so you can hand the dim sum lady your ordering sheet once you get seated. Food is served quite fast here and we got our first dish within a few minutes. For more details of the restaurant, check out our friend Eva's blog for her review of One Dim Sum here. Recommended dishes: Fried glutinous dumpling with salted pork (Harm Shui Kok), shrimp dumplings (ha gao), baked barbecue pork bun (char siu can bao), steamed minced beef balls. Affordable ? : Oh yes. THE dim sum restaurant that's adored by the drunkards crowds (cough*) and it's the place to go to if you're craving for dim sum at 3am! You'll get to share a communal table with fellow dim sum lovers. To order the dishes, either go up to the front where all the bamboo baskets are on the right side of the restaurant and take your pick. Those baskets are steaming hot though so usually the dim sum lady would ask you what you'd like and she'll help you stack them on your tray. Or you can wait patiently and the staff will come around, calling out the names of the dishes that just got freshly made in the kitchen. Recommended dishes: egg custard steamed buns, quail egg siu mai (pork dumpling), steamed pork ribs, deep fried milk (available at the cashier counter), steamed turnip cake. Dim Dim Sum is another dim sum chain that has several locations in Hong Kong. If you're looking for a spot that serves shrimp dumplings (har gao) and barbecued pork rice noodle rolls (cha siu cheung fun) at night, this is the place to go! Established in 1933, Luk Yu remains a classic tea house in Central. The restaurant is filled with old world wooden chairs and paintings. If you're looking for a less chaotic dim sum restaurant and want some peace while you enjoy your meal, this is the place to go. While there are no dim sum trolleys around here, you can order with a dim sum sheet and the staff will come out with a silver tray of goods such as cha siu so (barbecued pork pastries) and other Cantonese sweets from time to time. Do keep in mind that Luk Yu only serves dim sum from morning to early afternoon, and they change their dinner menu to classic Cantonese dishes in the evening. Recommended dishes: sesame seed with egg yolk bun, deep fried prawn toasts, barbecued pork buns, fried dumplings. Affordable? : It's in the medium price range and it's definitely more expensive than the previous dim sum restaurants we mentioned. Just like what our Eva mentioned in her review at this 2-star Michelin restaurant, dim sum is usually a casual meal shared with family and friends, so having them at a fine dining setting is definitely reserve for special occasions! The dim sum here are more delicate and you'll get to dine in front of a perfect view of the Victoria Harbour. We suggest making a reservation prior to your visit so you won't have to wait in line! Yan Toh Heen is also known for their Peking Duck and we also highly recommend it for dinner. Affordable? : Save it for a special occasion or if you're down to splurge a little! And that's a wrap! What's your favourite dim sum dish and restaurant?